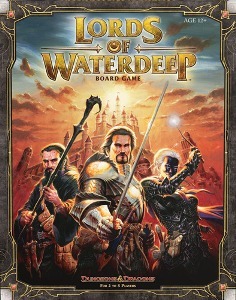 Players take on the role of one of the masked Lords of Waterdeep, secret rulers of the city. Through your agents, you recruit adventurers to go on quests on your behalf, earning rewards and increasing your influence over the city. Expand the city by purchasing new buildings that open up new actions on the board, and hinder – or help – the other lords by playing Intrigue cards to enact your carefully laid plans. Remember that what can’t be gained through trickery and negotiation can be taken by force!